Curtain Fitting Service, Tracks, Poles London South, West, North. curtain fitting service at Denmay Interiors offer to customers who purchase from us or not. Our fitters are experts in fitting all kinds of curtain tracks, poles, hand-drawn, corded and motorised . We offer fitting service for curtains, blinds and shutters. Our friendly uniformed fitters will visit your site fully equipped with all tools necessary to hang the curtains and dress your windows to your taste. These Services are available in all postcode areas of Greater London. We supply metal track for bay windows, custom made on site to fit any shape, suitable for all weights of fabric. Our curtain fitting service provides strong and smooth running of curtains. Steel white corded track is is pre-made and ready to take home and install.The Ultraglide curtain track is available with telescopic adjustment and extra long lengths of up to 600 cm. We have a large selection of heavy duty curtain tracks for commercial use such as theaters, cinema, restaurant, hotel, nursing home and offices. 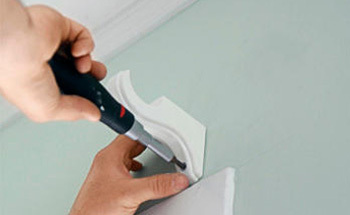 Our tracks can bend to fit any shape of the bay window and reverse bends. Can be fixed to the ceiling or the wall. Silent Gliss tracks and poles. Silent Gliss curtain tracks are known for quality and reliability and used extensively by interior designers in commercial and domestic projects. safety and security is our top priority. Flexible booking options, including weekends and evenings. Supply and installation or installation only. Roman blinds supplied & fitted. Roller blinds supplied & fitted. Venetian blinds supplied & fitted. Bay tracks & iron wrought poles. Silent gliss curtain tracks and poles supplier. Made to measure corded track. Repair work on old tracks and poles.